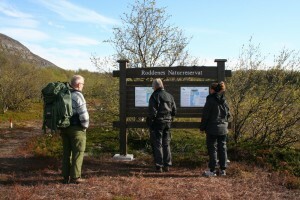 The nature trail at Roddenes is located close to the Roddenes nature reserve on the east side of the Porsanger fjord, and is a 2.7 km round trip. There are information boards along the trail. The area is of great geological interest. Halfway along the walk there is a shelter with a wonderful view of Porsangerfjord to Reinøya. You can rest here and enjoy the surroundings. The trail is marked with red posts.